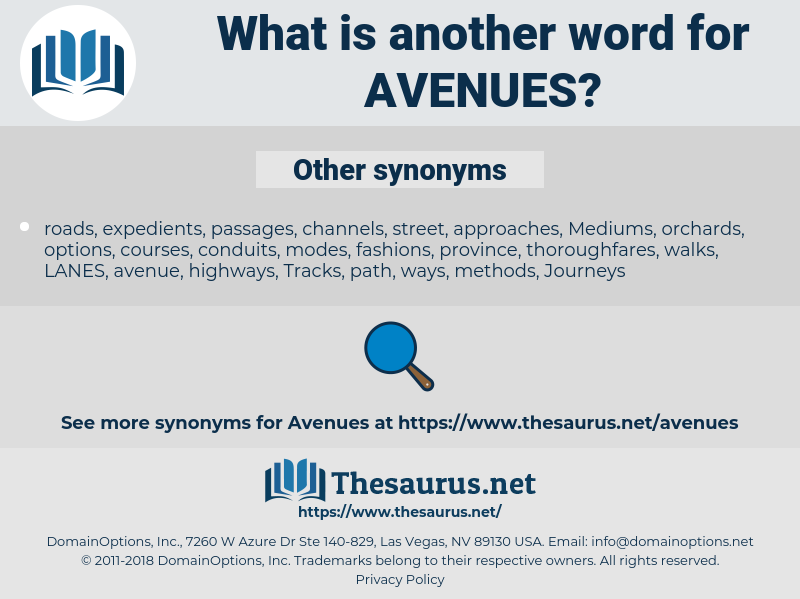 What is another word for avenues? availability, multiculturalism, considerations, alternatives, average, ways, determinants, waterway, waterways, factor, factors, potential, manner, instruments, contributors, PROSPECTS, interface, elements, inputs, moderate, possibility, Possibilities, Medium-sized, carriage, capability, Capabilities, how, Facilities, Resources, methods, scope, drivers, Remedies, openings, capacity, tract, approaches, harm, media, medium, tools, S2, options, ground, mean, modes, YC, possible, motion, Motions. 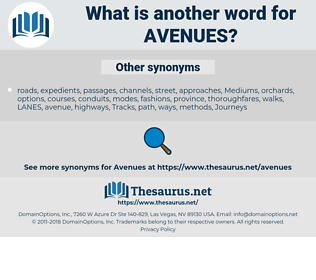 thoroughfares, LANES, techniques, highways, Instrumentalities, initiatives, headings, crossing, crossings, Measurements, crossroads, heights, interpretations, understandings, corridors, roadways, permutations, nouvelles, manifestations, Constituencies, averages, restraints, quarters, driveways, alternative, routings, tunnels, formulations, cornerstones, exits, opportunites, nullahs, Collaborations, passageways, Eventualities, canals, directions, Miles, fountains, locations, Occupations, methodologies, proceedings, railroads, Arteries, east, courses, roads, mannerisms, Suggestions, enablers, Measures, mechanics, Prescriptions, steps, constraints, compartments, Distances, segments, situations, LONGLINES, relationships, Branches, substitutes, Arenas, directorates, manners, divisions, conveyances, practicalities, expectations, mechanisms, influences, Guidelines, informants, clues, portions, Trajectories, organization, Organizations, directorships, outlets, potentials, variations, facteurs, arguments, conduits, premises, patterns, occasions, perspectives, runways, viewpoints, livelihoods, Stations, threads, accesses, groupings, occurrences, equations, details, settings, combinations, Angles, chains, gates, arrangements, Referrals, markers, Perceptions, solutions, appearances, propositions, bridges, Areas, Addresses, Pleadings, uses, recours, components, niches, grounds, variants, departures, Hotlines, Probabilities, tubes, railways, assets, ventures, strands, garrisons, localities, waters, Bureaus, Cues, NODES, turrets, beatings, tiers, walks, Infections, complaints, seats, places, dimensions, causes, courts, trains, terms, Contingencies, Keys, markets, vas, Necessities, yards, pipelines, clusters, Diversities, Vistas, affiliates, airfields, disciplines, variables, voies, echelons, Attitudes, NPMS, chemins, circles, Environments, machineries, appeals, Faculties, Journeys, Races, nets, Selections, instances, grooves, moyens, targets, axis, recursos, mountains, sites, respects, spaces, scenarios, outposts, levers, careers, drains, withdrawals, MEDIAS, recourses, contacts, devices, Travels, structures, rooms, Provided, lengths, SLOPES, tenets, traces, stripes, frontiers, passages, rails, lignes, fields, domains, monies, fashions, things, chances, airstrips, VOTES, backgrounds, wordings, sides, FACETS, Promoters, versions, Activities, arms, Vehicles, answers, outings, horizons, fuentes, carcases, customs, planks, applications, shortfalls, relays, Tendencies, offerings, tactics, spheres, guides, pleas, outflows, paradigms, pillars, axles, insights, processes, Visions, ducts, sidings, shapes, guises, Ideas, procedures, aspects, Capacities, tracts, features, WEBSITES, actions, Industries, Lifestyles, agendas, scopes, workings, feeds, defences, responses, Abilities, medios, trades, throes, modalities, ratings, thrusts, sectors, circuits, leads, plans, assaults, positions, formas, vectors, Carriers, logistics, sources, facts, phrases, balances, Formulas, Formulae, Axils, systems, sets, living, poles, forecasts, frameworks, outputs, FORMATS, points, Freedoms, networks, pistes, fronts, rows, funds, practices, Voices, supplies, proposals, flumes, subjects, Ones, Forums, Fora, outlooks, airways, Feet, Carcasses, Mediums, odds, pointers, Styles, doors, Bandits, blanks, TVS, springs, fonts, news, Habits, Dies, powers, hoses, Recipes, Axes, teeth, mode, spots, deals, wires, hints, topics, tips, sheets, flows, kinds, slots, items, models, runs, actors, possibles, pieces, choices, Floods, links, pipes, scenes, fixes, posts, Focuses, types, themes, Bears, Forms, Lives, Bodies, sorts, trips, wheels, considerations, schemes, alternatives, LINEs, ways, determinants, waterways, factors, potential, instruments, contributors, PROSPECTS, elements, inputs, Possibilities, streams, Capabilities, Facilities, Resources, methods, drivers, Remedies, openings, media, tools, options, modes, possible, Motions. means, opportunity, Opportunities, streams, PATHWAYS. streets, Orientations, trails, strips, means, opportunity, Opportunities, PATHWAYS. There were vistas of deserted streets and avenues. The two monarchs met, each surrounded with a gorgeous retinue, in one of the magnificent avenues which conducted to the castle. ahvenanmaa, aphonia, abohm, abm, avian, apium, apnea, avon, apian, avifauna, Appian Way, ape-man, Affine, ayapana, avena.